Firming, Toning and Stretch Marks Appearance Reducing Oil I Love! My new BF Clarins Tonic Body Treatment Oil! How are you doing today my loves? What about the 30 day Squat Challenge, still working on becoming a bootylicious babe with me? I know you are trying your best to complete this challenge. I’m trying my best too. Even though it’s just only one challenge you have to do each day, sometimes it seems like a lot, it’s not as easy as you imagined and I’m telling you the truth right now, I almost quite many times too! Believe me you’re not alone and you can do this! Let’s finish it strong! Before we get into my post, I want to mention that this post contains affiliate links*. 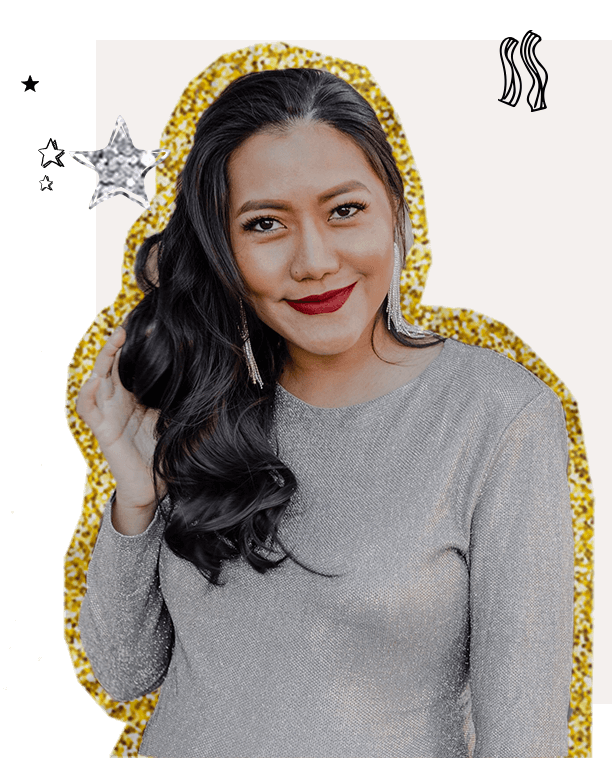 Today I want to have a quick chat and tell you about the new product I’ve just discovered and recently feel in love with. I think it’s a good idea to share with you guys today because this month we’re doing the Squat Challenge and this product may help you feel even better! I know you already knew about the benefits of performing squats but let me mention a fews here, toning and tightening your behind, abs, and, your legs are goals! Do you agree? 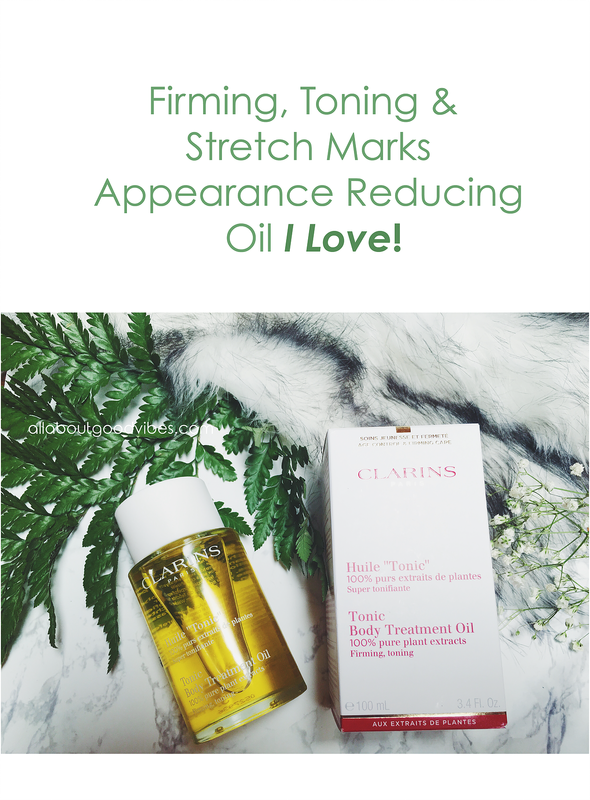 So the Clarins Tonic Body Treatment Oil is one of my new helpers for the tone and the tight with a plus of stretch marks appearance reducing benefit. I purchased mine from Nordstrom and been using it for a few days now. Why am I in love with it after a few uses? Am I too easy to fall in love with something? OMG! Maybe! LOL! The real answer is because I can see the result after a few uses. I feel the tightness at the area I applied the oil on. My stretch marks tend to get lighter too. I can’t wait to see the result after using for a longer period of time. The sense is amazing. It’s somehow help me relax and reminded me of a spa day. After I got it, used it and fell in love with it, I went to their website and read more about the benefits. I should have done this before I purchased but you know what, sometimes reading someone else’ reviews makes me feel bad for the company and sometimes for the person so trying it by myself is the best way to explore. I love doing it this way. Clarins’ #1 selling body oil — with 100% pure plant extracts including Rosemary, Geranium and Mint — helps firm, tone and improve elasticity, reducing the appearance of stretch marks resulting from pregnancy. Hazelnut Oil softens, smooths and hydrates by locking in moisture. Aromatic natural botanicals promote an overall feeling of well-being. Preservative-free. You can see more information at clarinsusa. 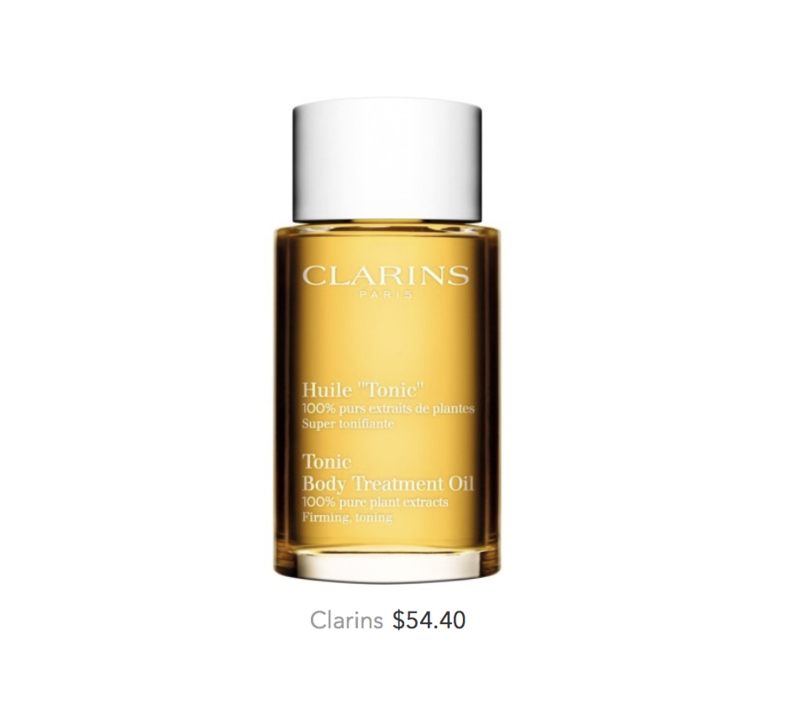 Try Clarins Tonic Body Treatment Oil by yourself and let me know how you like the results! I am planing to do a full review on this product, be sure to subscribe to my email list so you will get notified by me right in your inbox. Alright, that’s it for today! I hope you like what I’m sharing with you today. Don’t forget to get y0ur squats in today! If you haven’t started the challenge yet, take a look at my Blog Post and join us now! Keep those booty tone and tight! Happy squatting!